We've had resident germs here all week, with Little B being the worst hit. The other two Little Peeps have not been unwell as such, but have obviously been in need of some slow, restorative stay-home time after a busy half term at school. We ended up cancelling our plans to go away for a few days and instead have embraced the comforts of home. I think all five of us have benefited from this quiet time, it has suited us all for various reasons. For the Little Peeps, it has given them time to play, to hang out with friends, to lounge around watching films, to just relax and recharge their batteries. For J and I, it has given each of us time to indulge in our hobbies. As a result of this stay-home-time, I've been enjoying a lovely, happy creative week, with lots and lots of unadulterated hooky going on. This morning I was down at the café for my usual Friday knit n natter morning, I confess it was the first time I had left the house in half a week. It was such a pleasant morning! The sun beamed in, the latté was fabulous as ever, ditto the freshly baked, still warm chocolate twist. I worked on my chunky rainbow stripes whilst chatting with friends and felt wrapped in a warm cloud of happiness. I received buttons through the post yesterday, gosh, what pleasure I had opening that boring looking brown envelope. I can highly recommend ordering buttons if you fancy delivering yourself a bit of colourful feel-good. I just adore these colours, they remind me of my favourite Rice melamine cups. They will be perfect for my current project which is destined to become a cushion by the way. I wanted to make something easy to test out this new stitch, and a cushion seemed like a good idea. Currently half way through, and I think I've finally cracked the pattern (the start and end of each row was causing me some problems as it was pulling to the left and getting all skewed, but all sorted now). I'll be writing it up for you soon, it's a very, very simple pattern, kind of a bit like a spike stitch, but with a few differences. The results are visually very lovely, and create a beautiful, textured dense fabric, perfect for cushions and bags. My second order of chunky yarn arrived this morning (I've a third and final one on the way), and it is rather divine. It's a lot more expensive than the (100% acrylic) Stylecraft as this is a pure merino wool and only 50g balls, but oh it is lovely. The third chunky yarn I'm going to try is a mix of the two, an acrylic/wool blend. I can't wait for it to arrive, isn't mail order just amazing these days? I do try and use my local yarn shops where possible, but after trying both the ones in my town neither had what I was after. I'm searching for the *perfect* chunky yarn for bag and cushion making...I have a number of designs percolating away nicely in my Creative Mind just waiting to be unleashed. I'm in a very happy creative place right now, it's buzzing around here! Texere is dangerous - LOL! I do wish the King Cole merino was a bit more widely available - it's such good value for money for what it is - and really rather nice to crochet and knit with too. That stitch is really pretty. I think the closer spring gets, the more my mind spins with ideas and projects I want to do. I loved the beautiful moss covered roots of the tree in your pictures. When I was at Mt. Rainier with my daughter and grandkids, we walked through a beautiful forest with moss and fallen trees and a pond, and my granddaughter and I kept finding perfect fairy lands and houses! I just want to thank you for all of your time and talent you have shared with us. I took a crochet class here in town just so I could crochet your granny stripe blanket. I am in the middle of it right now and also in the middle of the ripple blanket. We have winter from December to almost April here (still not use to the cold, below zero temperatures that we moved to). Thank you for your easy to understand instructions and this new creation you have shared with us. You are so talented and your color choices are wonderful. I also love the pink pillow (different colors in the middle of each squar of pink) that I have seen in some of your posts. Hi, Lucy. Jan at Sew and Sow Farm introduced me to your blog. Love the colorful piece you have pictured today! Delicious looking yarn. I can't wait to see the finished cushion. It's amazing how different the pattern looks between the first and third photos. I LOVE buttons!!! I bought a huge bag of buttons, some vintage ones, and some regular off the shelf buttons for my littlest man's first birthday party ( cute as a button too, he is). So much fun. Sounds like you've had a lovely week, although I'm sorry your littlest boy has been unwell. I hope all is better now. 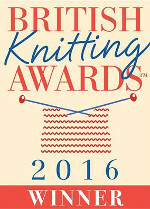 I do envy you your knit and natter group, I so wish there was one here I could join. Occasionally I take my knitting when I meet ordinary people for coffee, but it's just not the same. If I was a braver person I'd start my own group, but I'm not sure that I can put myself out there quite that much. The new yarn is looking good, and you're right, online shopping is a wondrous thing. I'm looking forward to seeing what you make. I love saving buttons. My friend has a really lovely wooden box to keep hers in. Lots were ones her mum saved. I love buttons they can be used as all sorts of embellishments - The WoolWarehouse is a fab company isn't it? Really love the stitch pattern. I'm sure you've heard this already, but it reminds me of Ikat fabrics. When I saw you creating the swatch, I was thinking of a cushion or a bench/stool cover. Nice work, Lucy! Who makes the Merino chunky yarn? do hope those 'bugs' have stayed contained.....love the new pattern!! I love to read your story. I like the colours and bottons. My english is not so good to express the happyness of them. The new yarn looks lovely. I almost always order online, mainly because I'm in the Netherlands. How do you find choosing your colours? Sites vary a lot, but sometimes the pictures bear little resemblance to the actual colours. Do you tend to order one of everything? Have literally just made the lovely bread (for the umpteenth time!!) but instead of plopping out the dough and shaping on a flat surface, I shaped it in the bowl and left it covered with cling film. After half an hour I then plopped it in the warmed dish and hey presto, turned out brilliantly, with no sticky fingers!!! Parcels are always exciting- button and yarn parcels are amongst the best. Hope all small persons feeling better!